While the tell tale signs of mold- blotchy patches on walls, ceilings, floors or furniture- are sometimes visible, mold often thrives out of sight- inside wall cavities, behind leaky shower stalls, in crawl spaces or attics. As a matter of fact, these confined, poorly ventilated areas are usually the most likely places for mold to thrive, out of sight, and out of mind. But where there is mold, it will proliferate. There is no such thing as a healthy amount of mold in the home. Like termites, it will continue to consume affected building materials until they are gone, if not treated promptly. More importantly, mold releases spores and bioaerosols that are harmful to the health of people exposed, especially children, the elderly, and those with weakened immune systems or allergies. These harmful substances can be transported via diffusion, drafts, or ducts throughout the home from concealed spaces. Even if mold is visible, the causes of the problem, the extent of the infestation, and threats to occupant health and the home itself may not be immediately apparent. But an expert mold inspection can help. Armed with specialized knowledge and precision tools and sensors, a mold inspection professional can tease out the root cause of mold problems, assess the extent of the damage, and put you on the right path to ensuring the health of your home. How does a mold inspection pro conduct an inspection? Moisture is, of course, one of the primary ingredients necessary for mold growth. But sometimes moisture can be difficult to detect. Some materials like plaster, wood, and insulation can feel or look dry, but are actually moist with just enough water to be a problem. Moisture meters detect the conductivity of a material, suggesting weather moisture is actually present. This information can help a mold inspector locate problem areas and track down water sources. Thermal cameras can also help detect moisture. By creating a picture of moisture inside a material, they can help identify what areas are suffering from a moisture problem, and the imaging can point a source of the water. When water begins to evaporate, it cools the surrounding material. This temperature difference can be seen on a thermal camera, and in this way, thermal imaging can even locate leaks behind walls or ceilings, where mold is likely to originate. 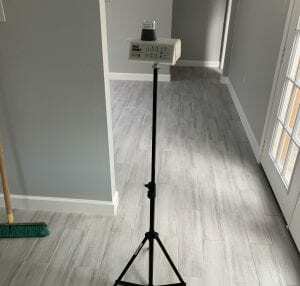 Thermal imaging can also help locate and diagnose moisture that accumulates due to condensation and temperature gradient problems that are likely to lead to condensation in a home, caused by issues such as improperly installed insulation or vapor barriers. Relative Humidity and Dew Point Sensors. Mold-causing water doesn’t have to come from a leaking pipe or roof. High humidity can also support mold growth. High indoor humidity can also contribute to the formation of condensation which can support mold growth as well. To diagnose these problems, sensors that can measure relative humidity (RH) and dew point (the temperature at which condensation can form) are deployed. They can indicate systemic building problems or HVAC issues that may be supporting mold growth in a home. Any time mold is suspected in a home, a mold inspection professional is likely to take air samples. Air samples provide the most direct test of the health impact of any mold growth in a home. There are several different types of sampling devices, but they all collect microscopic particles from the air for later analysis under a microscope. Samples are typically taken at several locations within the home as well as one or more taken outside, as a control. Analysis of these samples can provide the mold inspector with confirmation of mold spores and toxins in the air, and how their concentration compares to outdoor air. This can help diagnose mold problems, their severity, and narrow down likely causes. Surface sampling is the collection and analysis of visible mold growth or spores at a particular location. When mold growth is visible and accessible, surface sampling can offer more specific information about the location. This analysis can determine whether a visible stain is in fact mold, and what type of mold it is. This can give valuable information about the dangers of the growth, and likely sources. Professional mold inspection technicians use information from these tools in combination with visual inspection and considerable expertise to piece together a diagnosis of any moisture, mold and associated health problems as well as the causes of the problem. From this, they can recommend a plan for remediation of the mold and corrections for the underlying cause of moisture. Only with this expert professional assessment can homeowners be sure that their home is safe for themselves and their families. While some mold problems can be obvious, like a leaky sink causing visible mold on a wall and cabinet. But other situations may be less obvious- high humidity in dirty ductwork, a bathroom exhaust emptying into a soffit, a shower located near a fresh air return, poorly insulated refrigerant lines- all can cause moisture in less than visible places. Mold is more than just a simple problem. It’s a health risk that necessitates professional help. But don’t fear; mold remediation professionals have the gear to put you on the right track to a healthy home.